Cruising the waters to the north of Norway offers dogs, ice hotels and heavenly lights. It was a bumpy ride, but a thoroughly enjoyable one. And it helps to have a well-padded behind. Dogsledding in Tromso is a half-an-hour adventure. You sit two to a sled pulled by eight huskies with the driver behind. The wind in your face, and the white scenery going by make for an exhilarating experience. The huskies are friendly, allowing you to pet them. I didn’t have to worry about losing any fingers. Coffee and cake at the end of the ride served as a great warm up. This was part of my bucket list — to see the Northern Lights (Aurorea Borealis) and experience the northern cold. It does take some time to prepare for such a journey, so it’s good to start thinking about it now if you’re planning to head in that direction. I travelled to the Norwegian shipping line Hurtigruten (www.hurtigruten.com), which sails all year round. You can choose which ship you would like to sail on, what time of year and what onshore excursions you would like to participate in. Obviously the excursions will depend on the time of year you sail. 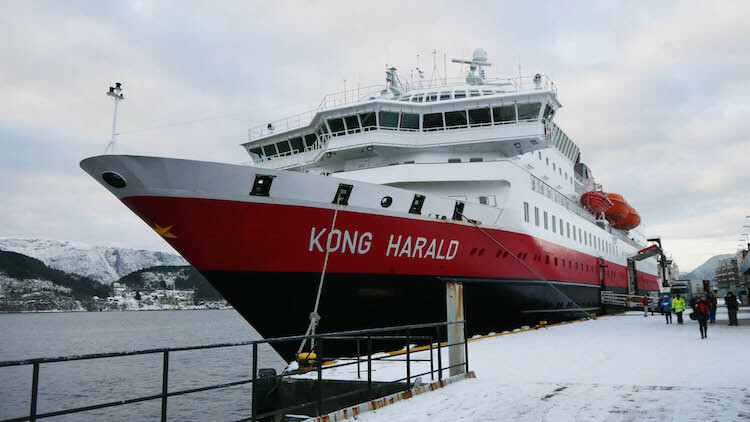 Hurtigruten ships are actually working ships — they also deliver passengers and cargo — and the ships are much smaller to be able to navigate the fjords. I went on the Classic Roundtrip Voyage in January from Bergen, Norway up to Kirkenes and back. The whole trip took 12 days and the voyage was very calm so if you are the type that gets seasick easily, don’t worry and besides, there are sick bags all over the ship! The ship sails to 34 ports, some long enough for you to get off and sightsee or do the excursions, some just for an hour or two, to stretch your legs and walk around the town. Now the bad news for shopaholics is that sometimes the ship docks at night and so the shops are shut. Also, Norway is a very very expensive country, especially for alcohol, with prices that rival those in Singapore.